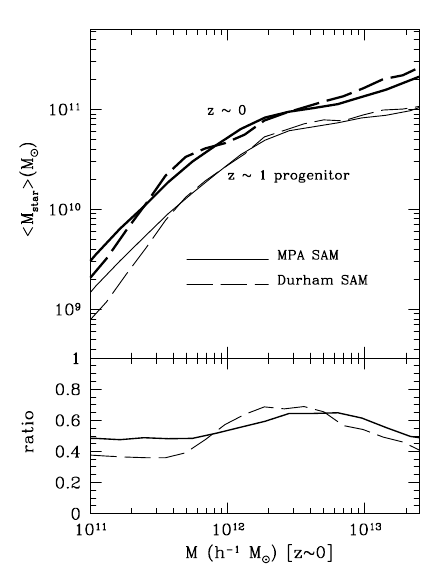 To me apparently the most important part of the paper is the comparison between SAM models and their previous phenomenological paper, which is more closely related to actual observations. The figures here are *extremely* misleading if you intentionally avoid the comparison part, as SAM can be guaranteed to be wrong on this level, which is also why the author claimed in the abstract that the phenomenological approach should serve as a guideline for the SAM efforts while the SA models are merely *important*. doubt anyone would trust the result, good idea though. Our model predicts a larger passive fraction among low-mass galaxies than is observed, as well as an overabundance of ˜1010 Msun galaxies beyond z˜ 0.6. (The abundance of ˜1011 Msun galaxies is matched out to z˜ 3.) These discrepancies appear to reflect deficiencies in the way star formation rates are modelled. 1. When did the Large Elliptical Galaxies Form? 6. Are dry mergers of ellipticals the way to reconcile model predictions with downsizing? "7. 化学演化模型最强的限制是abundance ratios。特别是alpha 元素和铁元素的丰度比。mass-metallicity 对于恒星形成历史限制不强。 当然，huang song 同学说的很对，如果恒星演化本身出问题（例如stellar yield不对），那么星系化学演化的限制就是毫无意义。事实上，有星系化学演化模型反过来限制恒星演化的工作，特别是对物理上都还不清楚的那些元素形成机制，s， r 过程，Li的形成与毁灭。。。"
which we label ReBEL (daRk Breaking Equivalence principLe). 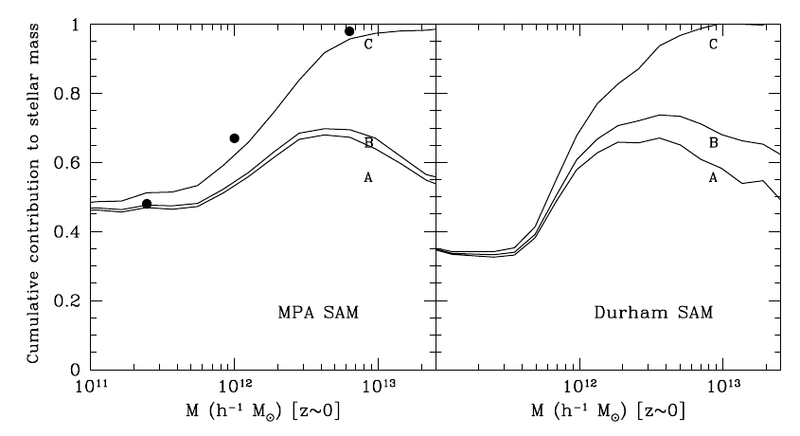 of galaxies with the system mass, in agreement with recent measurements.